I've finally started to catch up a bit on some model railroad blogs and Trevor Marshall's blog is certainly one of my favorites. Way back on May 5th, he did a post on the Employee Timetable he created for his layout and, since I want to create an ETT myself at some point, I've already bookmarked his ideas. I highly recommend reading his post if you want to create a model-railroad-appropriate ETT. 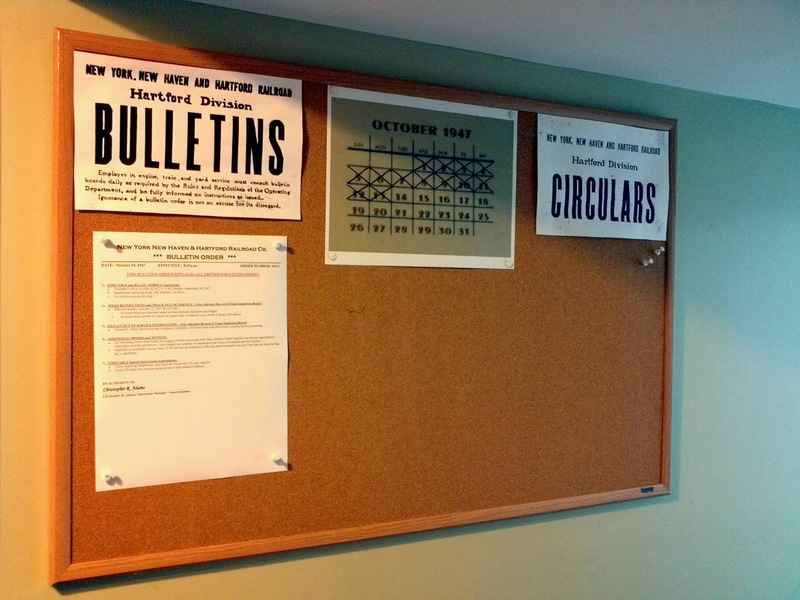 I'm not quite ready to do an ETT myself yet, so I've done the next best thing - set up a Bulletin Board (thanks to my buddy Randy). On it I can post - you guessed it - Bulletins! Well, more specifically, Bulletin Orders. The Bulletin Order (BO) tells operators anything special they need to know in addition to anything that would normally be in the ETT or the Operating Rules. This is especially helpful on my layout where there are some, um, particularly specific ways of doing things. But more on that in a minute. What's included in the Bulletin Order? So, what's all that mean for my model of the Valley Line? I can impart some authenticity to my layout by referencing the ETT and Rules that were actually in effect on the date I'm modeling. In my case, I operated on Tuesday, October 14, 1947 (you can tell what day it is by checking the calendar on the bulletin board, naturally :). On that date on the actual New Haven RR, Timetable #164 and the 10th edition of the operating rules were in effect. There's a liftout between the two modules, so I note a speed restriction between the stations of "Somerset" and "Draper." I also note a prototype speed restriction that acutally existed on the curve north of Rocky Hill station (which also has the benefit of lengthening the mainline run). I haven't yet installed the flashers that the prototype had at Main Street (Middlesex Turnpike) in Cromwell, so I note those signals are OOS (out of service) and require trains to stop & protect there. Until I get some FrogJuicers, I'm using toggle switches on the modules to control turnout frog polarity, so I note that under "Additional Orders and Notices." Finally, since I have a 10-car limit in runaround capacity in Middletown yard, I note under "Timetable Special Instructions/Amendments" that trains departing Middletown yard cannot exceed 10 cars. I also have an "award winning" (inside joke) depressed-center flatcar that is VERY light when unloaded - so I require it to be placed just ahead of the caboose when being moved empty. You can see the result of all this in the document below. Every operator gets a copy of the latest Bulletin Order with his other paperwork (Clearance Form A & Form 19) and, according to the Rules, he must review the bulletin board in case there are any last-minute changes. Until I can get around to compiling a model-appropriate version of the New Haven ETT - as Trevor has done with his CN version - I think BOs will suffice quite nicely.